Looking For A Title Company Coral Springs? 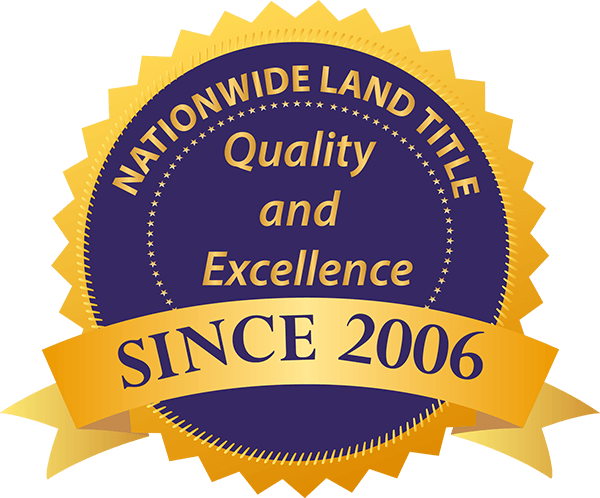 Nationwide Title Company Coral Springs has been providing title searches and title insurance for many years to Coral Springs. Since 2006, Nationwide Title Company Coral Springs has maintained the reputation of being an outstanding, service oriented and knowledgeable company in the title industry. Our continued commitment to providing superior service rests firmly on a foundation of years of financial stability, long-term professional team members, and long-cultivated relationships with the industry’s most trusted underwriting companies. Nationwide Title Company Coral Springs continually strives to be a beacon among title companies in South Florida. In these times of economic struggle and corporate distrust you should take comfort in the knowledge that your title company is sound.Nationwide Title Company provides Title/Closing services to Real Estate Agents, Buyers, Sellers, Lenders and Homebuilders. We have professional closers statewide who can meet with borrowers at any time and in any location to execute closing documents. We provide title..Nationwide Title Company is a certified provider of continuing education and takes great care to assure that employees have ample opportunity to attend classes provided within the company and by any one of our Underwriters or affiliates several times each year. All employees, licensed and non-licensed receive continual training on topics pertaining to the industry. We recognize that it is vital that we continually educate ourselves in order to offer our clients the best service available. Our underwriters represent the best the industry has to offer, allowing Nationwide Title Company Coral Springs the unique ability to supply our clients with the best possible title rates and coverage. Our commitment to community, experience and relationships truly sets Nationwide Title Company Coral Springs apart. Allow us the great pleasure of earning your business through excellence in service.The core of our beliefs is emulated in our mission statement “Earning Your Business Through Excellence In Service”. This short sentence exemplifies our commitment to the relationships within our company and those we have gained over the years. We stand firm in the belief that when you work with us you become a member of a professional team. Our greatest asset is our outstanding staff, we take great pride in this fact as it speaks to our commitment to excellence and consistency in a market of constant change.